The Latino Student Association held their annual Sabor Latino dinner on Saturday April 6. They offered a variety of traditional Spanish foods as well as many dance performances. A portion of the proceeds from the dinner were donated to The Worker Justice Center of New York (Josie Kwan/Assoc. Photo Editor). The Latino Student Association presented Sabor Latino in the MacVittie College Union Ballroom on Saturday April 6, a dinner intended to highlight aspects of Spanish culture and raise money for the Worker Justice Center of New York. Members of LSA Executive Board prepared traditional Spanish foods including black beans, white rice, sweet plantains, beef and cheese empanadas and pollo guisado (chicken with onions and peppers). 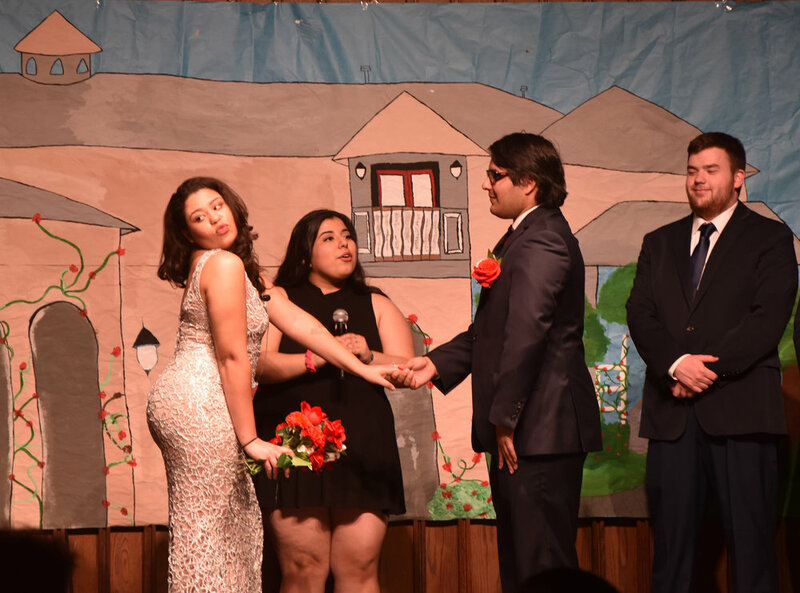 Sabor Latino is LSA’s biggest event of the year, and this year’s event focused on Spanish novelas which are soap operas popular in Spanish countries such as Mexico and Columbia and are characterized by exaggeration and drama. LSA members performed a skit with salsa dancing to display Spanish culture. Business and Spanish double major freshman Valentina Chavez choregraphed a dance for the skit and played the role of Mía. Public Relations Chair of Arts for LSA Patricia Figueroa devised the idea for the skit, which is about two people who love each other but have been tragically forced to separate. Jose and Mía are in love, but are separated in a love square, as Jose is engaged to Veronica, and Lucas and Mía are together. Veronica fills the typical villain role, as she is merely out to get Jose’s money and attempts to kill Mía. She has also murdered Jose’s sister in order to get his money. The skit is resolved as Veronica’s treachery is revealed in dramatic fashion, reflecting the exaggerated quality of Spanish novelas. Mía arrives at Jose and Veronica’s wedding to tell him that Veronica killed his sister, and Jose and Mía end up together. The lovers are happily united as the audience enjoyed the excellent acting and dance performances. Ten percent of Sabor Latino’s profits went toward The Worker Justice Center of New York, which helps obtain justice for people who are denied human rights, like agricultural and other low-wage workers. They provide legal representation, work toward community empowerment and advocate for institutional change to those deprived of human rights. “We had chosen them last year and figured we would continue the tradition because their work is very important to us,” Chavez said. Sabor Latino enjoyed a great turnout, as the organization appreciated attendance from other cultural clubs including Shakti, Banghra and Black Student Union, as well as many members of the Geneseo student body, faculty and community. LSA organizes many different events throughout the year to showcase aspects of Spanish culture. They host La Mezcla each fall—another dinner filled with dancing and fun—as a part of their intentions to raise cultural awareness and bring the Geneseo community together.